Suzlon – Are you listening? My first encounter with wind mills was some 15 years back near Kayathar in South India. It was a spectacular sight at that age to see a line of giant fans running with the speed of the wind. But over the years design of the wind mill remains the same and i haven’t seen any change in it’s basic structure. I saw this cool design in the net while surfing here. 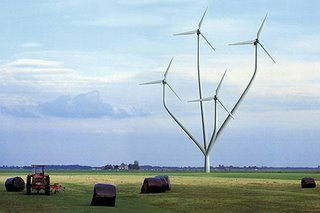 This flower arrangement with wind mills design concept is very much attractive. More than the look, it can be cost effective also as it occupies less floor space, hence more profitable. With the kind of energy needs that is growing, a tree a home is no longer enough to keep the pollution at bay. May be we need to have this kind of flower power plant every home some day….. Wind turbine manufacturers like Suzlon have to be more proactive and put in more into their research to really usher us the greener tomorrow.